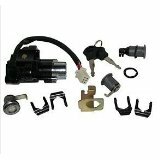 This ignition fits most Chinese Scooters/Mopeds, ATVs, GO-Karts and Motorcycles with the 6-Wire Ingition configuration and 150-250cc Engines!!! It comes with 2 keys, 3 lock sets, and mounting brackets!!! Both keys fit the locks and ignition!!! Check out the detailed pics to make sure this will fit your vehicle!! !